"She's the target of every eye...including eyes only science could create." 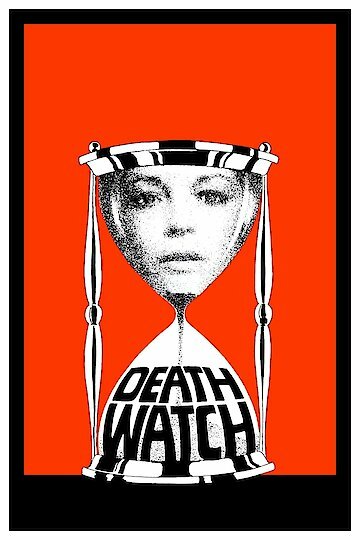 The movie Death Watch explores a deadly illness that a woman has contracted. There is something unusual about this illness. Katherine gets this illness and has the chance to become famous. She is offered a lot of money for her family if a network can turn her last days into a reality television show. She agrees then goes on the run with her friend Roddy. Roddy is a cameraman for the station but she does not know this. He underwent a surgery where cameras were implanted behind his eyes. If he sleeps or closes his eyes for too long he will go blind. What Katherine does not know is that her actions with Roddy are being filmed and shown on television. The viewer is left wondering if Roddy will choose to go blind and end the reality show. The movie stars Romy Schneider, Harvey Keitel, and Harry Dean Stanton. This is a French movie. Death Watch is currently available to watch free on Tubi TV and stream, download, buy on demand at Amazon Prime, Amazon, Vudu, Google Play, iTunes, YouTube VOD online.